Award winning journalist John Rayburn covered major news and sporting events for more than 60 years on radio and television. 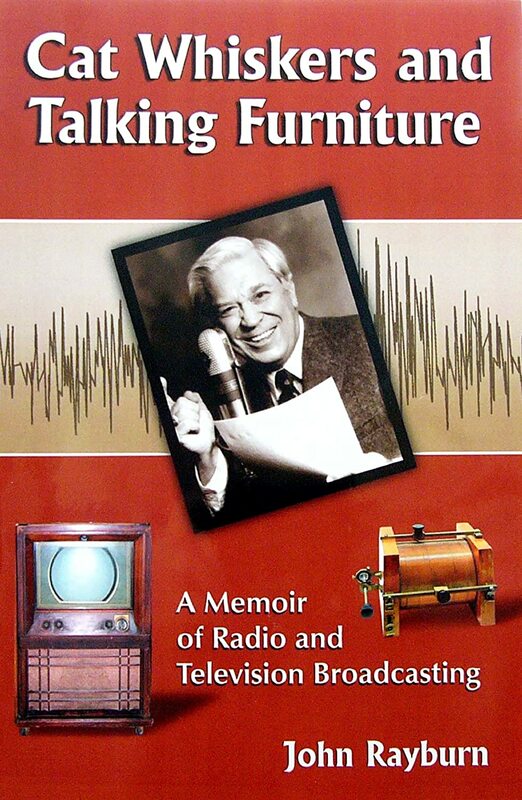 He offers here a witty and warm-hearted account of historic developments in seven decades of broadcasting, including recollections of Edward R. Murrow’s live broadcasts from London in World War II, the heyday of Little Orphan Annie and her secret decoder badges, and the early days of live (and sometimes flub-filled) television broadcasts. Using an extensive on-air career as a centerpiece, the 115,000 word story digs into behind the scenes broadcast activities that never reach the public eye or ear. The early days of broadcasting were often on a sort of catch-as-catch-can basis but improvements were introduced that broadened the scope of the industry. The so-called “Golden Age of Radio” would have been shortened by the advent of television but introduction of the visual medium was put on hold by the need for more metals and electronics in World War II. His list of interviews included the likes of Ronald Reagan (then SAG President), then-Senator John F. Kennedy, a special occasion with Presidents Nixon and Truman, plus numerous other well-known politicians. His sports interviews and conversations included Stan Musial, Bob Feller, Bill Veeck, John Elway, Johnny Unitas, Arnold Palmer, Jack Nicklaus, Muhammad Ali, Jack Dempsey and numerous others with the stories included in this book. The author’s often humorous encounters with such individuals as Jane Russell, Debbie Reynolds, Bill Stern, Alex Trebek, Red Buttons, Burl Ives, Milton Berle and Jimmy Carter are an added bonus. The stories wrap up with details of a hilarious live collapse of a television show set with the author pinned underneath. Many photographs are included. This is not fiction, so individuals were those with whom there were conversations/interviews. Also, a broad selection of background stories concverning thew profession of broadcasting. The first official radio broadcasting license was granted to KDKA in Pittsburgh on October 27, 1920, and the station’s first on-air activity was coverage of the Harding-Cox presidential election returns less than a week later on November 2. The industry celebrated its 75th anniversary in 1995, an anniversary that was noted by such diverse groups as the Broadcast Pioneers, the National Association of Broadcasters, the Museum of Television and Radio in New York and Los Angeles, the National Radio Hall of Fame in Chicago and many others. As a long-time broadcaster, I thought it was a terrific thing to do, and I was pleased about the attention being given to the business that had been my livelihood for all of my adult life. The only problem came when I realized that I had been around for more than two-thirds of radio’s history. But this is not just my story. My life is used primarily as a way to share wide-ranging anecdotes about the extremely talented people who participated, in one way or another, in this remarkable means of communication. This is their story. This is what they thought. This is what they had to say. Many conversations, interviews and comments from individuals from various walks of life were taken directly from recorded material, air-checks and film. The book you’re holding covers my 60-plus years as a broadcast professional, a career that continues at the time of this writing. I do a sports podcast for a newspaper group, yet another project prompted by the technological advances of the era. This book is also an historical glance at narratives that provide interesting, amusing and biographical information concerning the phenomenal world of broadcasting and those who made it function. It’s easy to sing the praises of something that has been such an integral part of your life, so I’ll say merely that my extended broadcasting experience in both radio and television have provided opportunities—to do things, meet people, go places, see things—that very likely would not have been possible in any other endeavor. I was one of the lucky few to fit into a vocation that I was meant for. A decent voice was there, something for which I can claim no credit, but I did learn how to use it in professional fashion. Working with microphones and cameras over seven decades, I developed a profound affection for my chosen field. In 1920, at the beginning of radio broadcasting stations, factory-made radios were expensive and in short supply. As a result, people were urged to either get a simple crystal set or build their own. No batteries were required to pick up signals, and the device could be put together with a few hand-made parts. It had been learned that a metallic mineral such as galena could pick up signals. A fine pointed wire was used to tune in a selected station by making contact with the crystal. This wire detector came to be known as a “cat’s whisker” and attained considerable historic significance. The stories here are designed to inform and entertain as well as to give at least a sense of what broadcasting has been like behind the scenes. John Rayburn spent several decades in broadcasting. He served as a news/sports anchor and show host on both radio and television. His TV newscast achieved the largest Share of Audience figures of any major-market TV newscast in the nation. His network credits include reports and appearances on The Today Show, Huntley-Brinkley News, Walter Cronkite News, NBC Monitor, NBC News on the Hour, etc. He recorded dozens of books for the National Library Service via the Library of Congress and narrated innumerable Radio/TV recordings, as well as hosting Senior Showcase for nine years on a PBS-TV outlet. He interviewed celebrities from many walks of life, including Ronald Reagan (then SAG President), then-Senator John F. Kennedy, Presidents Richard Nixon and Harry Truman, Bob Hope, Milton Berle, Debbie Reynolds, Mickey Rooney, Arnold Palmer, Jack Nicklaus, Art Linkletter, Hugh Downs, Charlton Heston, Gene Autry, Tommy Dorsey, Stan Kenton, Nat King Cole, Helen Forrest, Stan Musial, Mickey Mantle, Bob Feller, Jack Dempsey, Muhammad Ali, Red Grange, Johnny Unitas, John Elway, Leslie Neilson, Jane Russell, Alex Trebek, and hundreds of others. Rayburn has traveled extensively throughout the nation, plus Europe, the United Kingdom, etc., gaining information and making observations about our national foibles.